I woke up today with a flavour in my mind, I have no idea where it came from but there it was hanging over me like a thought you just can't shake. The flavour combination was white chocolate and hazelnuts. Now, I've always been a big fan of hazelnuts (or anything nutty really) but I do find white chocolate a little too sweet so I worried that putting this combination of ingredients into anything like a cake might be too overwhelming. And then I realised I had a big bag of rolled oats leftover from my granola shenanigans and I decided to make some flapjacks. 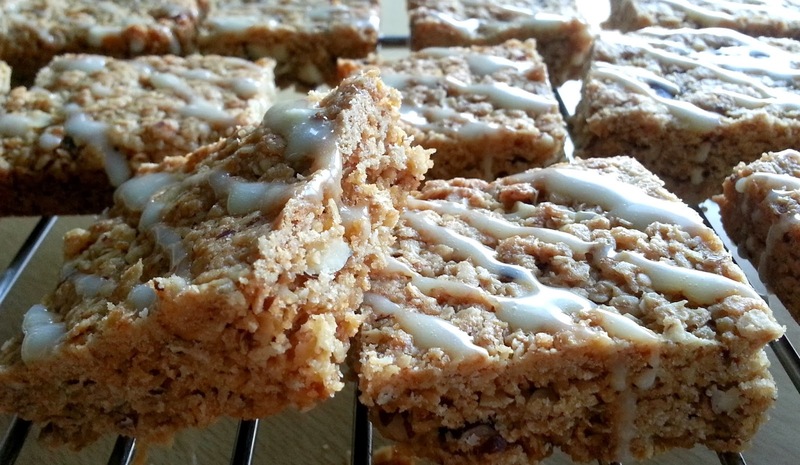 I like flapjacks, they're sweet treats trying to pose as healthy snacks and I like that kind of foodie deceptiveness. So flapjacks it was. 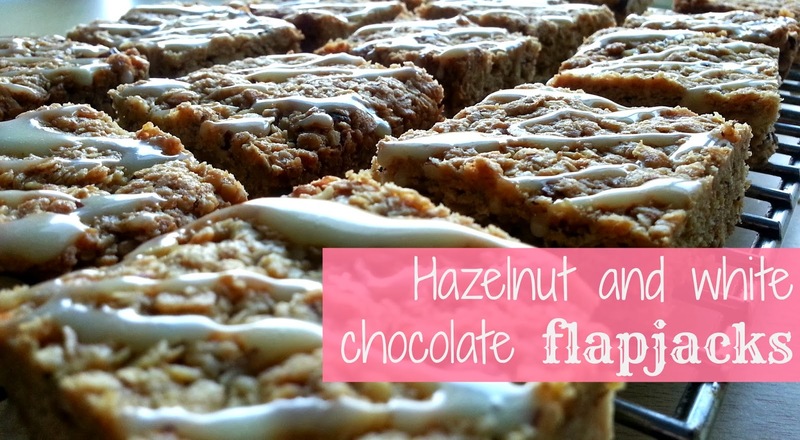 I started with a classic basic flapjack recipe and just added some hazelnuts and white chocolate chips. 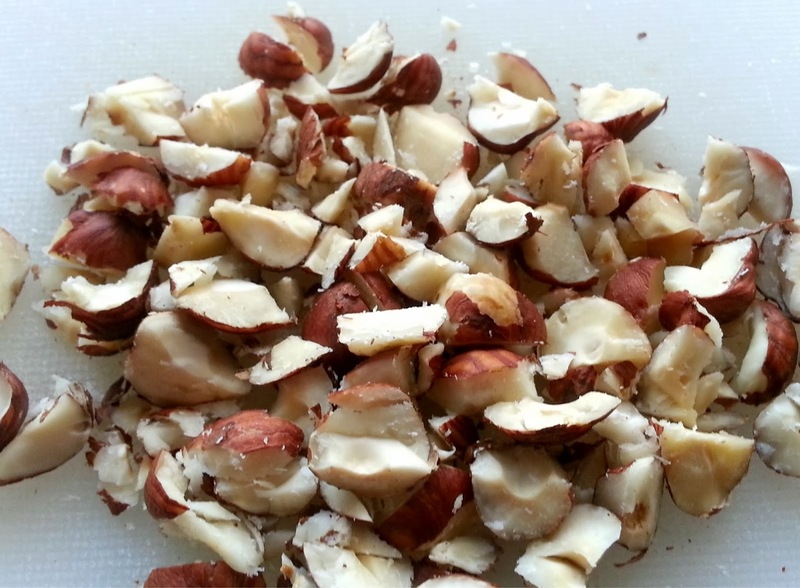 I chopped some nuts finely and others quite coarsely to give a variety of textures and the white chocolate chips kinda melted into the baked flapjack so you're just left with a little sweetness in every bite. I used a white chocolate milk glaze to top the flapjacks but they don't need it. They're sweet enough on their own and if you want people to think that you're being 'healthy' then omit it all together. 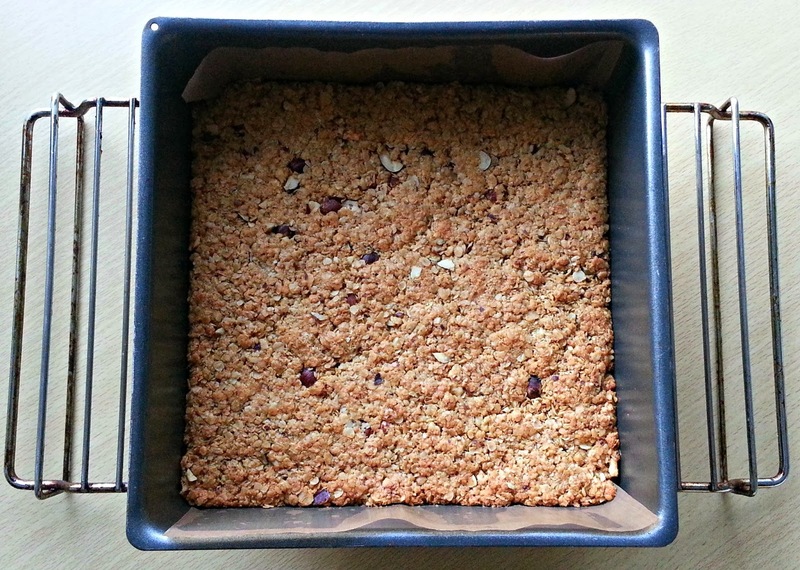 I baked my flapjacks for 30-35 mins as I like them with a bit of crunch on the edges but if you're more of a soft flapjack person then pull them out of the oven at the 25min mark. They firm up when cooling. Preheat the oven to 180C/160Cfan/ gas 4. Grease and line a shallow 20cm/8" square tin with baking parchment. Put the butter, sugar and golden syrup into a microwaveable bowl and heat until the mixture has melted together (about 1-2mins). Be careful when stirring as the mixture gets hot! 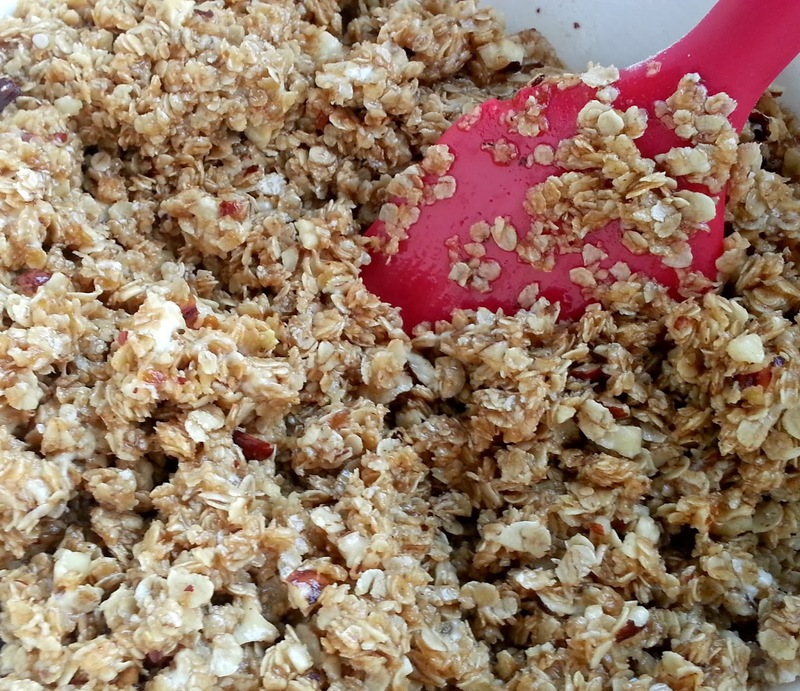 Stir in the oats and then add the hazelnuts. If the mixture is still very warm then wait a few minutes before adding your chocolate chips as they'll melt easily. Turn the mixture into the tin, level and press the mixture evenly and firmly with the back of a spoon. Bake for a min. of 25 minutes, or until just golden around the edges. 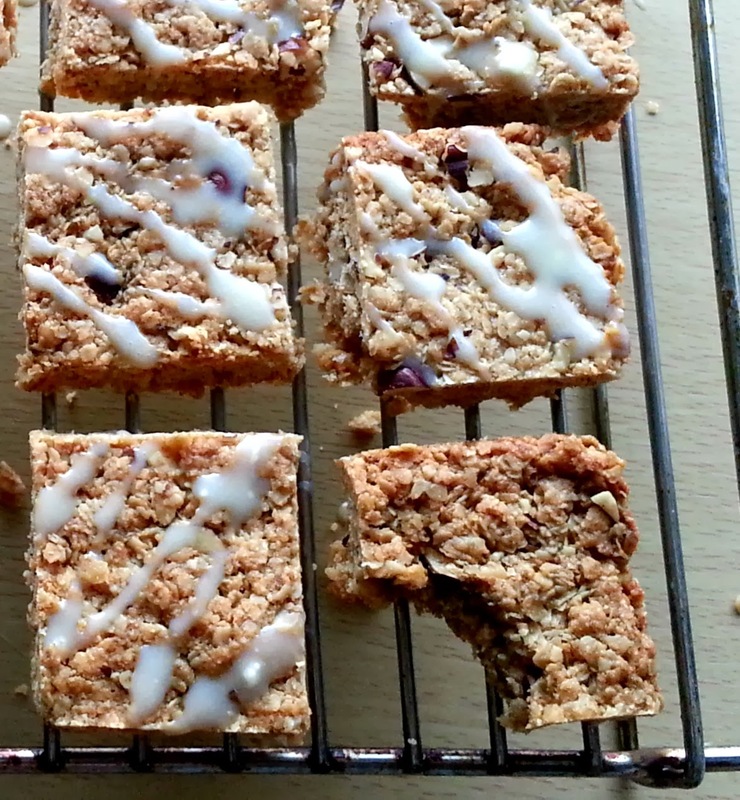 I baked mine for 30-35mins and waited till the flapjacks were browning around the edges. Remove from the oven and cool before marking the slices with a knife whilst the flapjacks are still warm. Cool completely before turning out onto a board and cutting again with a sharp knife.